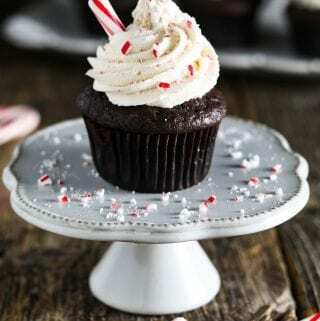 Vegan Chocolate Peppermint Cupcakes ~ the combination of rich chocolate, sweet buttercream, and cooling peppermint will bring on holiday cheer! Nothing says “It’s the holidays” better than chocolate and peppermint together. Wouldn’t you agree? 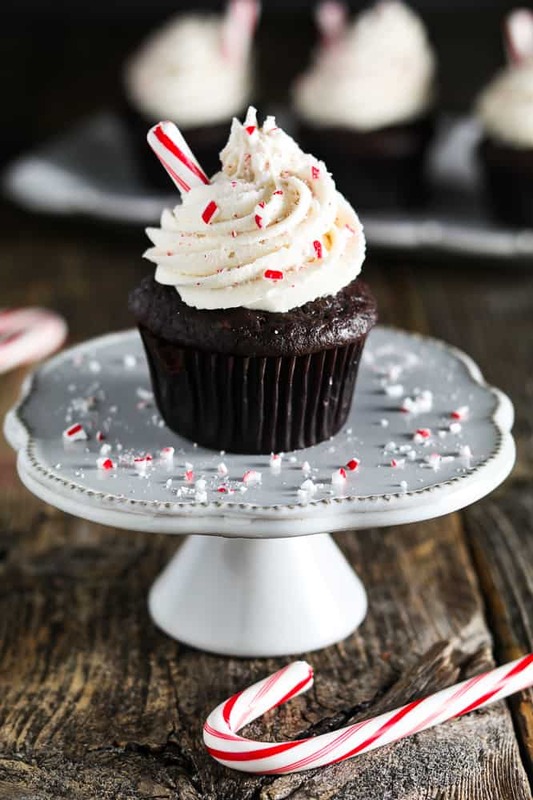 These Chocolate Peppermint Cupcakes are filled with festive vibes and neeeed to be in your life this season! If you’re heading out to a holiday party, take along these cupcakes and a batch of my Vegan Thumbprint Cookies. You’ll be the talk of the evening! They make great holiday gifts too! You can wrap them up with a mug along with Hot Chocolate on a Stick. These are gifts from the heart and are sure to make anyone feel loved. 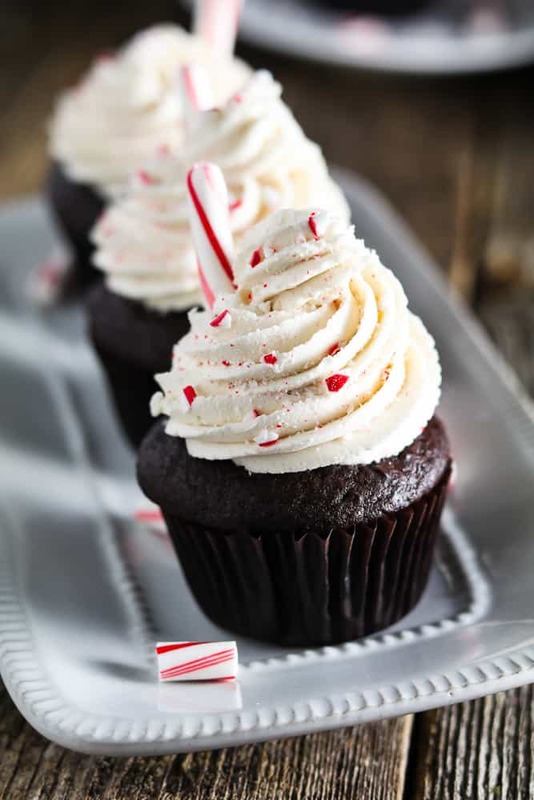 For these Chocolate Peppermint Cupcakes, I used Dutch Processed Cocoa. It took these cupcakes to another level! They came out so rich and chocolatey! I’ve used it for years but stayed away from baking with it because I’ve heard it could create undesirable results. Dutch Processed Cocoa has a neutral PH and won’t react in recipes with just baking soda. So, you can’t use it in any recipe to replace regular cocoa powder. However, I used apple cider vinegar to create a vegan buttermilk and that produced enough acidity for fantastic results. It’s a game-changer! I like NuNaturals brand because it’s organic, fair-trade and super chocolatey! 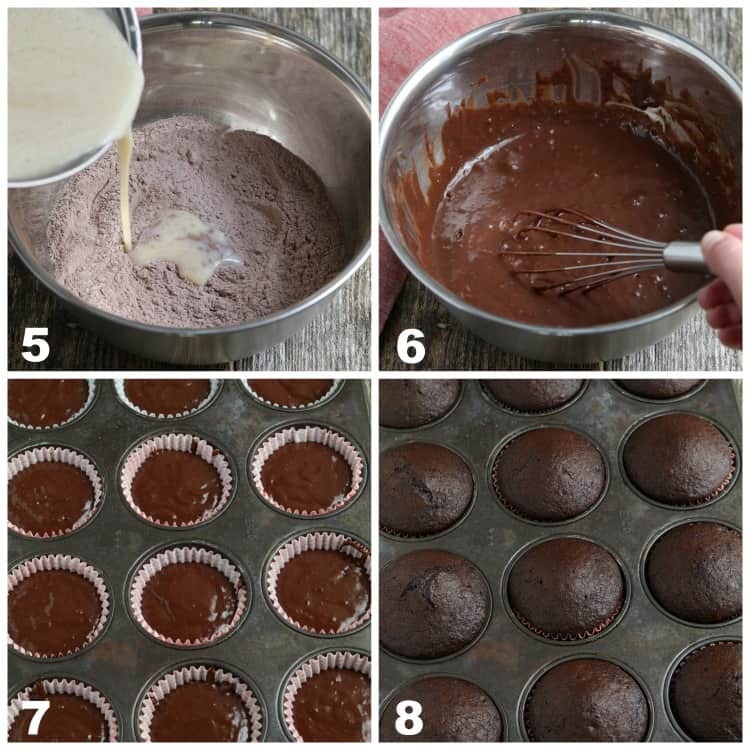 If you want to use regular cocoa powder for this recipe, the cupcakes will still be moist, fluffy and delicious! You can also boost the chocolate power by adding a teaspoon of Espresso Powder or fold in a 1/2 cup of Vegan Chocolate Chips to the batter. If you aren’t a big chocolate fan, you can make my Vegan Vanilla Cupcakes with the Peppermint Frosting instead. They are just as delicious! STEP 1 – Combine the soy milk and apple cider vinegar in a medium mixing bowl. Let it sit for 10 minutes. STEP 2 -Sift the flour, cocoa powder, baking soda and salt in a large mixing bowl. STEP 3 – Now whisk the dry ingredients to combine well. STEP 4 – Add the applesauce, sugar, vanilla, and oil to the medium bowl with the buttermilk. Whisk to combine well. STEP 5 – Slowly pour the wet ingredients into the dry. 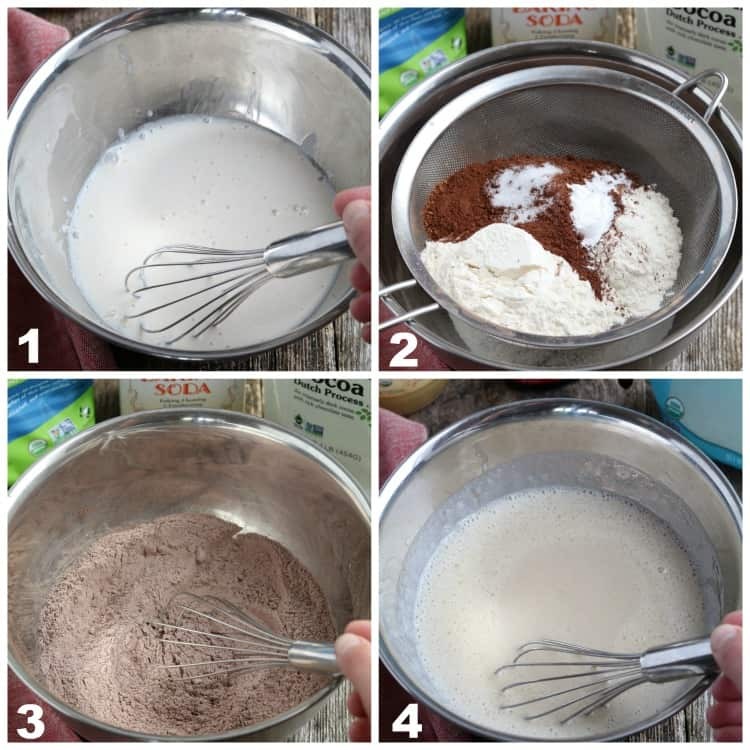 STEP 6 – Whisk together until just combined and don’t overwork the batter. Lumps are ok. STEP 7 – Fill cupcake liners about 1/2 – 2/3 full (*don’t fill more than that). STEP 8 – Let them cool in the pan for 8-10 before removing them. Then let them completely cool before frosting them. 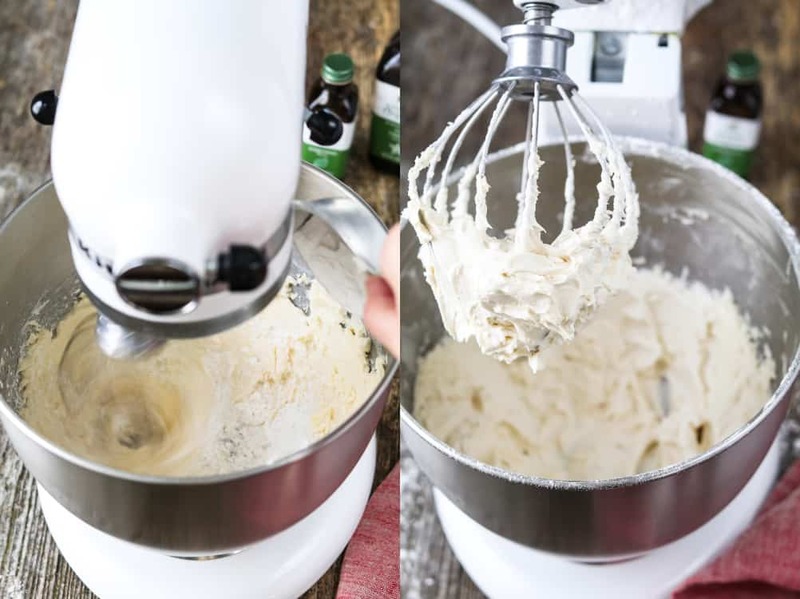 You’ll definitely need a handheld or stand mixer to make this Vegan Buttercream Frosting. If you’re in the market for one, I highly recommend this KitchenAid Classic Stand Mixer. I’ve had it for years and I use it all the time. It’s very sturdy and works like a charm! STEP 2 – Add the powdered sugar, 1 cup at a time over low speed until it’s fully incorporated. Scrape down sides as needed. Now turn up to medium-high speed and mix until smooth and fluffy. – First, you’ll need to fit a Disposable or Reusable Piping Bag with a decorating tip (you can also use a Ziploc bag). I like to use Extra Large Tips for fast and easy coverage. – Cut the end off the piping bag (just enough to fit the decorating tip) and place the tip inside the bag and through the hole. It should stay in place and not fall through. – Fit the bag over a tall glass or container. Keep the tip on its side so the frosting doesn’t leak out while you’re filling. Now fill the bag with the frosting using a spatula. – Remove the bag from the container and gently twist the top to close. You can keep it shut with a clip or use your hand to keep it closed while piping. – Hold the top of the bag with your dominant hand and your other hand at the bottom. Start at the edges of the cupcake. Squeeze at the top and guide the bag with your other hand making a circular motion. Continue around until you touch frosting – then move inside the circle you just made and make another rotation until the cupcake is covered. Need a visual? Here is a great Piping Technique Tutorial to watch. 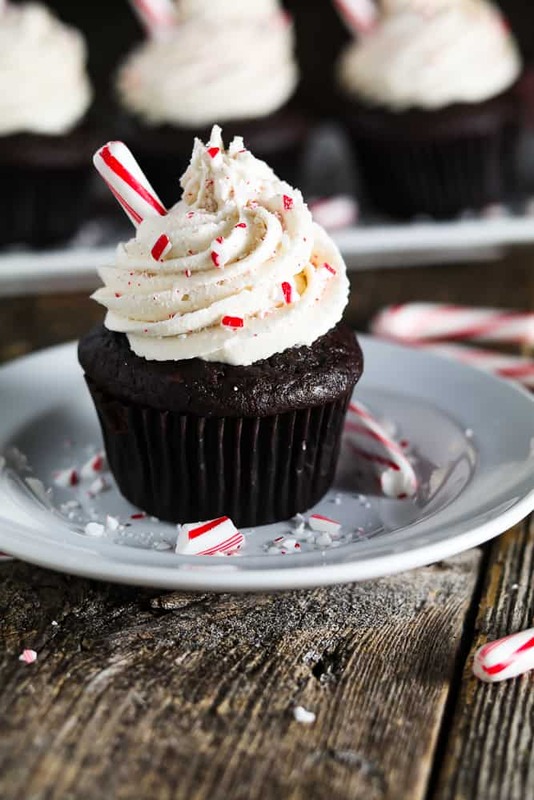 If you make these Chocolate Peppermint Cupcakes, let me know what you think by ★ star rating it and leaving a comment below. It would really make my day. You can also follow me on Instagram and share your creation with me. Just tag me @veganhuggs and hashtag #veganhuggs so I don’t miss it. In the medium bowl with the buttermilk, add the oil, applesauce, sugar, and vanilla. Whisk to combine well. Add the softened vegan butter to the bowl of a Stand Mixer (or use a Medium/Large Stainless Steel Bowl with a Hand Mixer). Beat until fluffy for 30-60 seconds. Now add the powdered sugar, 1 cup at a time over low speed until it's fully incorporated. Scrape down sides as needed. Now turn up to medium-high speed and mix until smooth and fluffy. Taste and add more sugar if needed. (*if the buttercream is too thick or dry, add a few teaspoons of non-dairy milk and mix until fully incorporated). 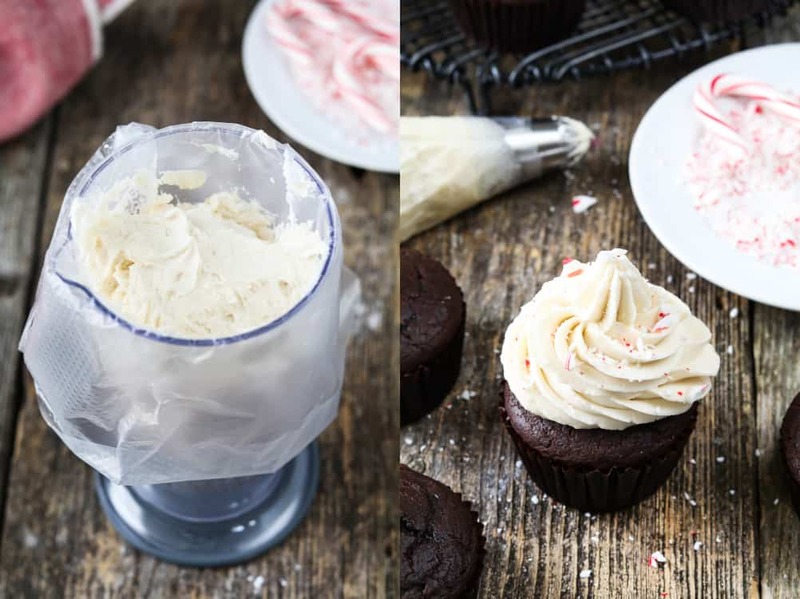 Fill a piping bag and decorate cooled cupcakes and top with crushed candy canes (*detailed piping instructions in the post above). If you won't be serving the cupcakes right away. Decorate the cupcakes and place them in the fridge for a few hours. Take them out an hour before serving. This will prevent the buttercream from melting. 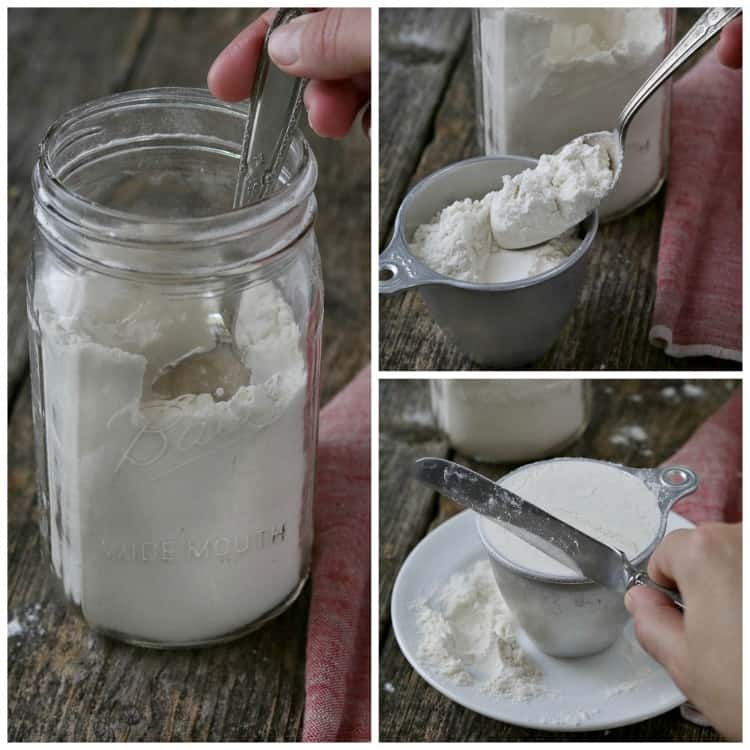 If you want to save time, you can use store-bought Vegan Frosting. I don't know how it will react with peppermint extract, so I would just add the crushed candy cane to the top. If you use regular cocoa powder and want to boost the chocolate flavor, you can add 1 teaspoon of Espresso Powder to the dry ingredients. I wouldn't add it with the Dutch Processed Cocoa Powder. I made these without the frosting and used unsweetened almond milk… they were incredible. Thanks for the recipe! These peppermint cupcakes were gone from the table in less than 5 minutes. 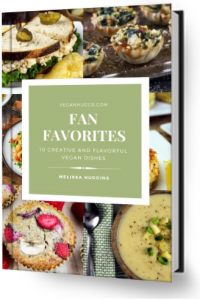 Perfect for our vegan Christmas dinner.